There’s so much that goes into every kitchen we design that it’s easy to miss the smaller details and intricacy of each feature. Therefore we’ve decided to break down our new Holkham project and give you a tour of this stunning room feature by feature. 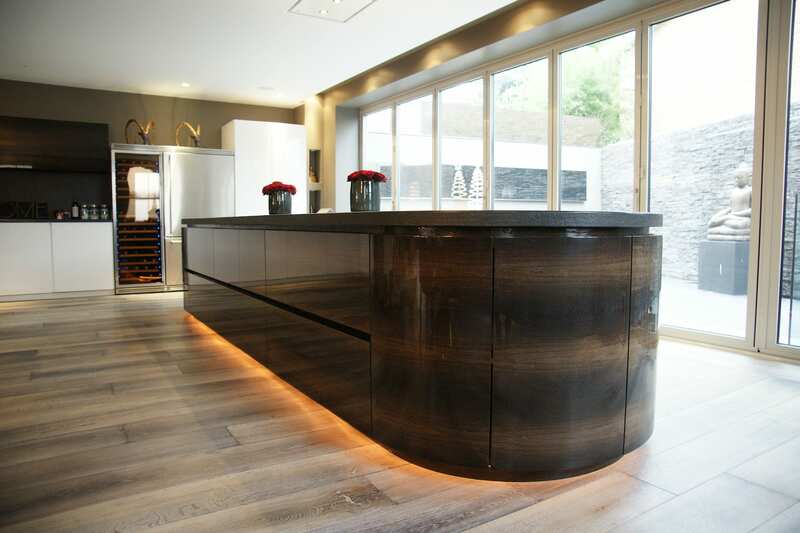 So grab a coffee and enjoy taking a tour around this beautiful townhouse kitchen in Hove. 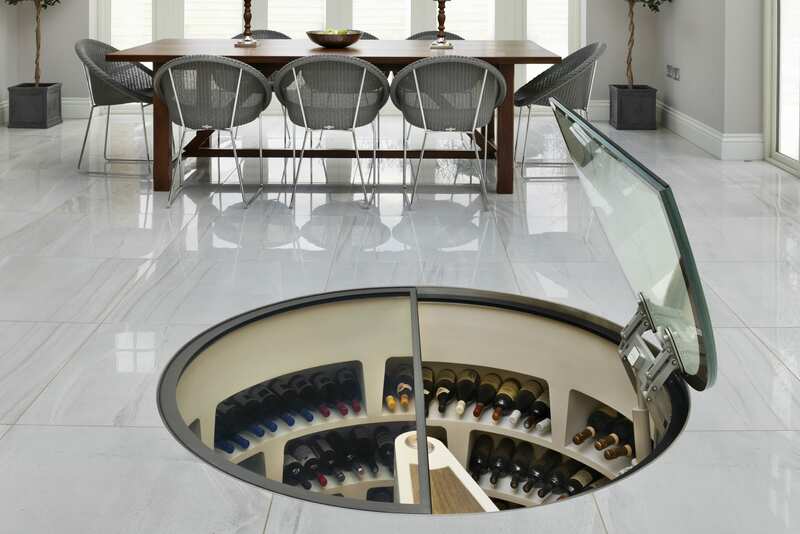 The key to a stunning and organised kitchen is planning adequate storage early on in the design process. This makes it easy to assign everything a place and even easier to put it there. The pantry in this project was designed to sit unobtrusively in the corner of the room with enough storage inside for all the family’s dried food. The variety of storage facilities within include shelves, drawers and spice racks making sure that each and every ingredient has a place and is easy to locate. 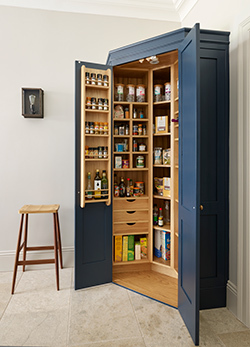 In fact our clients liked the design of their pantry so much that they opted for a second, identical pantry cupboard for the living/dining part of their open plan room! With young children the main focus of this kitchen was to make it family friendly – a space that Lorraine could indulge her passion for cooking, with room to involve her children too. The breakfast bar on the island is perfect for this. Lorraine can prep food and get on with cooking with her two young children sat just an arm’s reach away. 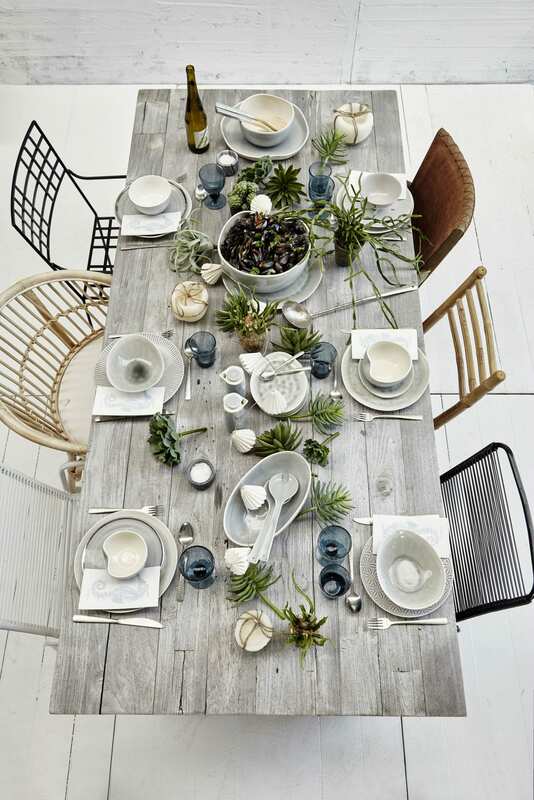 The statement pendant lights over the island add to the warmth of the room and assist in creating mood lighting for a cosy, welcoming atmosphere. Our clients, Lorraine and Dan, are keen cooks and it was absolutely essential that their kitchen was a real chef’s kitchen; fully prepared for busy family life and all the cooking that goes with it. The Lacanche range was their cooker of choice with a powerful extractor above to remove the steam and odours from their open plan room. In-keeping with the industrial design scheme a statement box canopy was chosen to house the extractor fan. 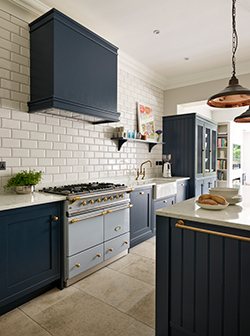 Against the stark backdrop of white metro tiles with contrasting grout the large blue canopy makes a stunning feature in the room and accentuates the generous ceiling height, whilst keeping the extractor fan concealed from sight. Not every feature of a kitchen design has to have functionality at its core – the open shelf above the sink is the perfect example of this. The glassware could go in the dresser and the artwork could be displayed elsewhere but why not indulge in creating something purely for the beauty of it? The colourful glasses and vibrantly coloured artwork is a stunning focal point and really brightens the colour scheme of the room. 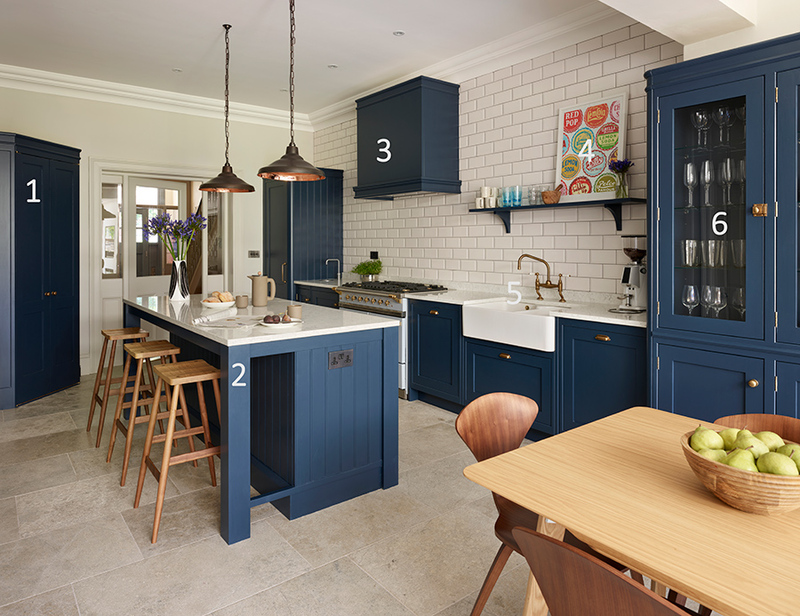 Aged metal finishes are growing in popularity and they’re a really effective way to introduce a touch of traditional warmth into a more contemporary scheme. 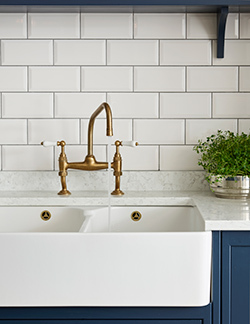 Set against white metro tiles the introduction of the antique brass tap softens the kitchen decor and introduces a slightly more classic edge to the room. The Belfast sink is the perfect pairing, lending itself to both traditional and contemporary styles. 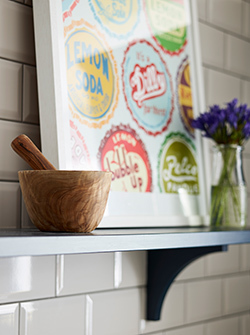 To add depth and interest to the kitchen we introduced a glazed dresser for storage of glassware and crockery. 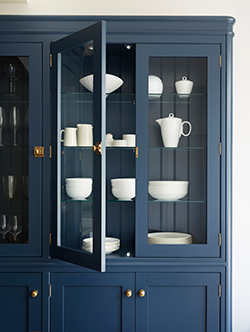 Dan and Lorraine planned to use the glazed cupboard for their white crockery which gives a striking contrast against the deep blue cabinetry. 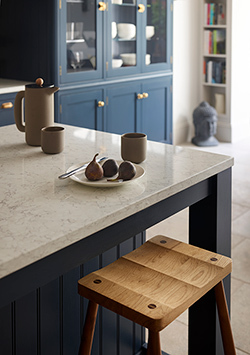 Tongue and groove panelling on the back of the dresser is a subtle but all important detail, another nod to classic kitchen design in this contemporary, industrial inspired scheme.